Who needs a hotel? Roadtrippers highlights this singular Swiss Alps cabin, which is tucked into a sculpture garden and looks for all the world like a giant boulder. If you're driving by and really squint, you might just notice a strange square window carved out of the rock. Hidden inside is a fully functioning cabin with a bed, a table, and even a fireplace. The building was a challenge taken on by Swiss design studio Bureau A, who named it "Antoine" after a character who gets trapped under a rock for weeks in the novel Derborence by Charles Ferdinand Ramuz. The entire thing took about six weeks and a load of careful planning to build. The shelter is built from wood and encased in a concrete shell that's broken only by a single window, skylight, and door. Antoine is reasonably well kitted-out, and contains a wood burner, plus some basic fold-down panels that serve as table, bed, and seating. There's no toilet though, and you'd want to be careful when venturing outside to take care of business, as Bureau A reports that the shelter is installed in a very precarious spot. The project was created to host visiting artists and built by hand in a nearby mountain village. 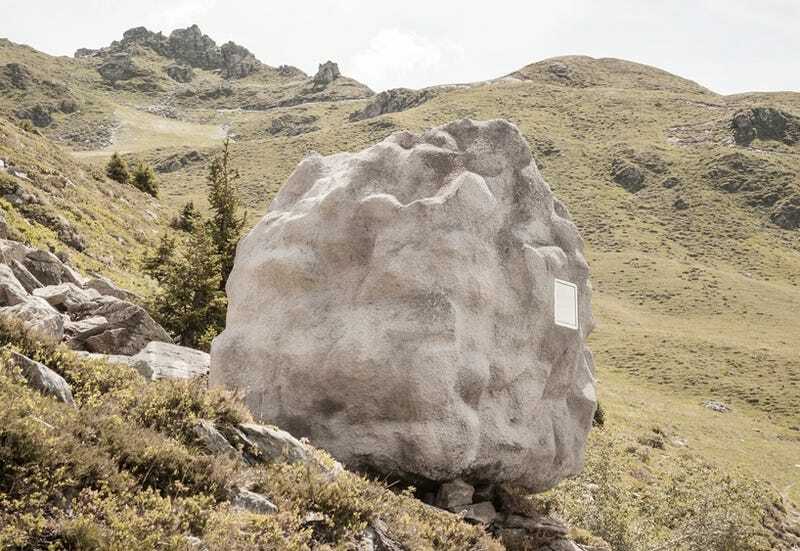 Watch Antoine being installed in the below video, which is soundtracked by a certain highly appropriate Rolling Stones song, and start plotting how you can pass yourself off as a "visiting artist" in the Alps ASAP.